Take in some of the region’s best capital views, including Georgetown and the National Mall. With monumental views of Washington, D.C. and just a 10-minute walk to Georgetown, the Rosslyn neighborhood is a favorite place to stay, eat, shop and meet when visiting the capital area. Rosslyn also offers easy access to three Metro lines (Orange, Blue and Silver), buses (including Metrobus, Arlington Transit (ART) and the D.C. Circulator) and major highway connections. Spectacular views of the D.C. skyline, myriad dining options and an urban vibe make it an ideal home base for exploring the capital region. Right across Key Bridge from Georgetown, Rosslyn’s tall buildings are surrounded by natural beauty and historic landmarks. Visitors should not miss the iconic Marine Corps War Memorial (Iwo Jima); nearby Arlington National Cemetery; Arlington House, The Robert E. Lee Memorial; and the Theodore Roosevelt Island National Memorial. Another must-see sight beginning in 2018 is The Observation Deck at CEB Tower featuring 360-degree views of the region from more than 30 stories up. Well-lit and pedestrian-friendly sidewalks are alive with visitors enjoying outdoor dining, public art and staged live music and cinematic events. It’s an innovative economic, social and cultural hub for the area, with an authentic city feel. Rosslyn also boasts nearly 30 sit-down restaurants and dozens of fast-casual places. Enjoy a bowl of chili and a milkshake or a multi-course gourmet feast. Visit the three-acre Gateway Park with its ornamental garden, amphitheater and the largest sandbox in Arlington. 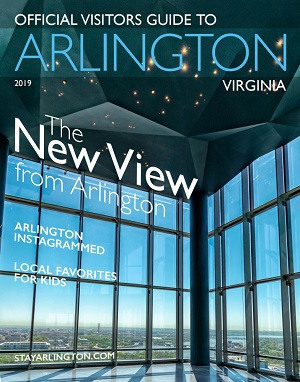 It’s the site of numerous annual events, such as the Rosslyn Cinema movie festival in the summer and the world-class Rosslyn Jazz Festival each September. For more information on Rosslyn, you can also visit the Rosslyn Business Improvement District (BID) website.